A: The item code to be created or edited. C: The description in foreign language (in case you need it). D: “I” stands for inventory Item, which is the default for SAP, you can skip this unless you want to create labor code “L” or a travel “T”. 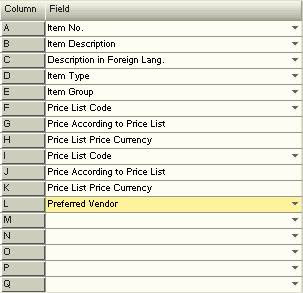 F,G and H, represent a price list data, column F means the price list nº 1, then H means the price you want to set for it, and the last you set the currency (make sure you choose the right currency, and check “rates”). L: Stands for the preferred vendor code. 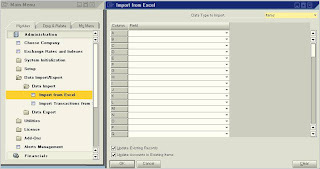 And select items on the upper right, then select the fields in the same order as you did the excel file. Check update existing records if you want SBO to edit the existing codes, if you wish only to create new ones and not risk touching existing ones. Then click OK (be sure the source file is closed, otherwise an error message will appear). Also the same way information for Business Partners can be created or edited quickly.